Thank you with all my heart for all the protection you have provided me daily. I know they are always with me, but at different times I feel very alone and lost. In these moments when I feel lost, it seems that I need to find a way to act and I do not know what to do or how to act. I want to act, help, accelerate. I look forward to living a great love, to have prosperity and success at work. I often feel selfish for thinking of me. I would like guidance, how should I act? What should I do? Thank you always! Love you! My dear daughter, greetings. The feeling of loneliness you feel is that of the search for the purpose you have come to realize, the meeting of your happiness. But before you discover this purpose you need to meet again. The feeling you have is natural to your physical age, but over time you will see that life calms our anxiety as we come to realize that from everything we encounter nothing will bring us happiness if it is not anchored in the heart. There is no need to feel selfish for wanting a prosperous life, because like every human being, you long for happiness. But up to a certain physical age, we still think it possible to find happiness in relationships, work, and material well-being. We do not say not to pursue this search, but to seek what you think today will bring you happiness, without guilt, without fear, because all this is part of your own process. And when you conquer everything you crave, you may still feel this loneliness, this helplessness that relates. Then this will be the feeling that will lead you into yourself, to discover that nothing you crave will bring you the happiness you seek. But see that before this encounter it is necessary that you continue to seek, to walk and to try to bring into your life your independence, a relationship, for all this is part of your journey and therefore must be lived with surrender, with acceptance and, Above all, without guilt. All we experience are experiences that will deepen us to see how empty the material world is devoid of our own love. Stay in peace. Hello beloved Masters. I attend a healing institution through my hands. Since 2010 I have done this work, but in recent months I have been asked about the methods of the institution, mainly related to money and everything that implies the offering, where it is said that it is to maintain the spiritual connections. I do not believe that I need to offer to connect spiritually, but I believe that every spiritualist institution needs to keep and needs donation. But I do not believe in the justification they use. It's got me away from a job that I feel so powerful. Could you give me more clarification about this moment? Thank you, dear ones. Beloved son. You are involved in works where there is the manipulation of powerful energies and they do bring food to the ego. In the work you are doing today, you are going through a test, from which to overcome it, you will perceive the overcoming of the ego and the feeling of power. You own yourself, but by manipulating powerful healing energies, you must always anchor the feeling of purest love. The feeling of power, and pursuit of upliftment, will be only a proof from which you have the goal of freeing yourself. Realize son, who works with powerful energies. And only through your connection with your Higher Self can you transmute that experience. He established contacts and connections in this incarnation, which have strengthened some that he brought with you from other eras, as an opportunity for overcoming and liberation. But he ended up narrowing those relationships every time he manipulated powerful energies without the feeling of pure love and charity in your heart. The liberation of this experience will take place through the force that you will acquire from yourself. In your quest for balance and connection, love and charity within you are lacking. That is why you have not established contact with the higher dimensions that you so much want. There is only one key that opens the divine pure energies and the connection with the I Am, my son, and that key is that of love. You will not be able to gain this access through practices and exercises. The connection with the heart is the only one that will establish this connection, and that will anchor forces in you to release the experience that you are not comfortable with. The release of the ego will come through the experience that does not please you, but the connection with the heart to your Higher Self is that it will bring the strength to love that experience and release it in peace and harmony. Do not expect anything son. Leave the relentless pursuit behind and surrender to the Divine with humility and knowing that there is only one Supreme wisdom, that of the Source of All That Is. Only this connection will bring the knowledge you seek after the long walk of experience and practice of charity through love. Stay in peace. Greetings Masters. First of all, thank you very much for helping us on our path of evolution. I come to you, ask you for guidance on my Life Plan. I have two children that I love infinitely. I try to pass the principles of love I've been learning, but I do not know if I'm doing enough. My eldest son (11 years old) is a bit depressed. He says he sometimes feels a great sadness, and says that he even has the will to die. And the younger one is quite nervous, and challenges me all the time. How can I improve as a mother, Masters? Am I being able to evolve? Thank you. Namastê! My beloved daughter. Their children are souls who already bring an inheritance, not only of this life, but of other existences. And when you see them like this, as children of God, as divine souls, then you can help them. 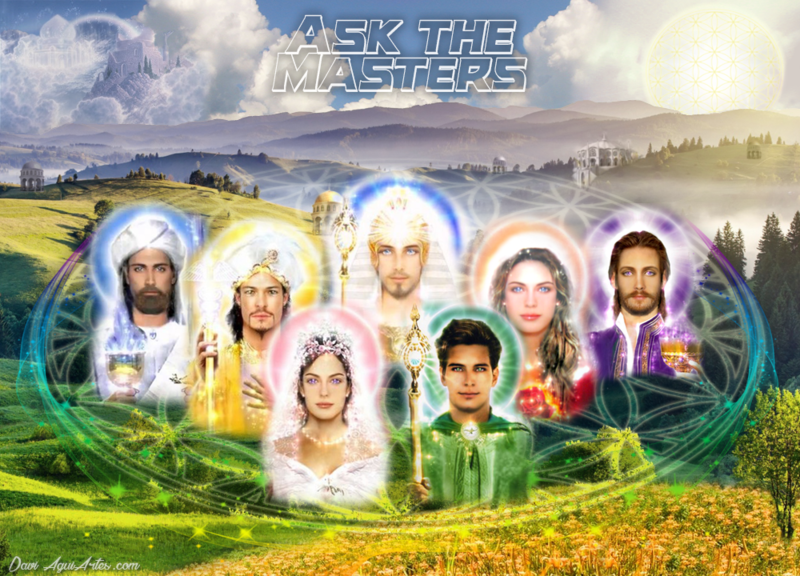 Understand that just like all of God's children, incarnated on this planet, they have their own process, their mentors, angels, and a whole host of beings already helping them. The anxiety that a daughter feels is because she still believes it to be all her responsibility to show the way to them. I say no, because your children when in physical sleep are instructed by the mentors and by all those who set out to assist them in the physical experience. But there is something you need to understand because of the maternal bond, you have a strong energetic connection and as a mother you transfer much of your anxiety, your sadness to them. That is why it is important that at such times, as you report, remain in peace, radiating love and serenity, for they will feel their steady energy and will mirror in it. The help you can give is energetic, talking in peace, calmly, being the example to them, but never believing that you are alone in this journey. As souls, their children, like all incarnates, are also in a process of inner purification, so it is absolutely normal that like any person also have their moments of difficulty. Try not to get emotionally involved and, conscious of the process, keep in your peace, radiate your love, which will always be the best. Masters, we moved out of town a year ago because of my husband's work. Since then I've been feeling very lonely. In the old city I was super fit and had lots of friends, and I was still close to my sister (I'm very attached to her). Here I could not make friends and I have the feeling that I went from a lighter dimension to a dense one with the change. It seems like every time I have friends, I end up moving out of town and staying away. Can you tell me why I'm feeling this way? Was the change in my Life Plan? Are we still going to spend a lot of time in this city? Will my children adapt here? Thank you for the opportunity to get in touch. Namastê! My beloved daughter. What you feel is longing for what has gone, but life is made of changes, new encounters, new perspectives. What you live is a training so that you understand the flow of life, so that you release the past with love and leave for new experiences with gratitude, taking the learning for what you lived. While suffering from the past, forget to look around and see how many wonderful souls there are beside you, who would also like to share your friendship. Instead of holding on to what has gone, people, look for to build the new, for something that satisfies and completes. And from there you will see how many beautiful souls there are in the world, how many opportunities pass daily in front of us while we mourn for what is gone. Happiness, daughter, is in learning to value what we have, rather than suffering for what we had. This is the lesson you need to understand. Learn to be happy enough in your life, the way you present yourself, understanding that God always brings us the best in our development. Be in peace daughter. I read a message from the site "From heart to heart" WHO ARE THE STELLAR SEEDS, and I have no answers. Since I was 12 years old, I believe or close to it, I feel like I'm missing something in this existence on this planet. Sorry for the words, but I always found "very little" what I was taught: we were born, we grew, we reproduced and we died. For what? Because? What have we become? Sometimes I caught myself asking God to take me away, because this planet is very bad. Much violence, much evil around nothing! I have always thought that people, Living Beings are Divine, but they do not see it. We do not gain anything by destroying others, the dreams of others. But at the same time I felt guilty for being undone of my incarnation plan, which I still do not know what it is. I have a mission like everyone else, but I do not know. I've been to Candomblé's house a couple of times to find out what my job is on Earth. They never told me. They say I can not know yet. I even wanted to go to Candomblé, but they did not let me. They said my place was not there. That I meditated to find my place, but at the time I was not mature enough to understand things. And no wonder ask what I came here to do because they do not say. They look at me with such tenderness, joy, love and affection, but they do not tell me anything. I had given up knowing until now when I read this message. Now I see that the family in which I was born, the paths I have taken professional and personal, the places I went, the people I lived with and the experiences I lived, everything, everything awakened me or I am close to the I Am. It's like you're putting me in my place. I have a feeling of enormous charity. I want to help everyone, I share everything I know and collaborate with everyone, provided I do not do anybody any harm. I did not know why these actions brought me a Peace, a feeling of great justice, a sense of encounter with something greater than I. I also could not fit into age groups according to my age. I've always preferred older people since I was a child. Even my academic work and research is tied to ancestral knowledge. Not to mention that movies like the Matrix Trilogy, Avatar, Lucy and Mutation Point, made me feel familiar. I always thought we were not the only inhabitants of this universe. A lot of pretension of humans wanting to control the universe, life without love for themselves and the other! As a child I can remember, I used to watch the night sky with infinite questions, but I also remember lights that stood in the sky near my window. It's as if they accompany me. I never said that to anyone, but it makes so much sense now. Is it possible to tell me whether I am human or not, if I am from another planet? If so, which one? How can I take care of my energy so that I can use my gifts to help others? Thank you forever for always being with me. For loving me so much, even when I knew nothing or did the "right" things. Beloved daughter. May the love of God be kept in your heart. Do you realize my beloved, who brought all the answers? What do you need to believe in the answers you brought yourself? Do you lack the courage to look at yourself as you are? Of all the pains he possesses, the greatest of them is the longing for the gifts that came to anchor in this world. You feel that you have treasures in your heart, which begins with your love, the feeling of charity, the sweetness of your soul. Yes, daughter, you are one of the souls that came with the simple mission of being here to seek its authenticity. You are one of those who came with the mission to expand the consciousness of humanity, raising everyone to new and better perspectives, showing that there is something more. But do not worry how you will do this, for it will happen at the right time. What he needs now is to seek his peace, to go against all this love that carries in his heart. When you find them, your gifts will shine like magic, as if they were miracles, but it will only be your beauty to shine. There is in the world a lot of violence, a lot of fighting, but there is also much peace, much ancestral wisdom. Seek for the peace of nature, when your heart connects with the miseries of the world, imagine the peace of a waterfall, the peace that radiates from the ocean, a simple flower in a garden. And as you change your focus, find your own peace that will reflect on your love. Gradually, by anchoring that peace, finding that love that carries within you, your purpose will be manifested and will become clearer to what has come. The feeling that brings daughter is of an ancient soul, who has already experienced peace and now again wishes to see it manifested. You have come to show light to those who see only the shadows, who are still attached to the hologram of illusion. They only see the shadows, but you can show the light with your love. For this, daughter, seek to fit into works that do you good, where you can help your brothers, look for groups that allow you to serve in love and charity, that every drop of light that spread will become a flood inside you. And that light will shine, for it will expand from your eyes, from your smile to show your love. Masters, gratitude for opportunity. I want to ask what I can do to get a better understanding of the lessons I need to experience now, and break this cycle of repetitions in my life? My beloved sister. The reps are there to take the lessons you need. The repetitions are your own lesson, so that you interrupt the cycle that has entered. They want to show you just that. How to break? Notice how they get along. If they are repetitions, what you need to do is find the point where they repeat themselves, and then act differently. Stay in peace. Messengers: Thiago Strapasson and Michele Martini – Feb/2017.